Hardy in zones 5-9 Mature Height: 48-60 inches Loves the sun Blooms early spring to late summer Immediate shipping in 3" pots. 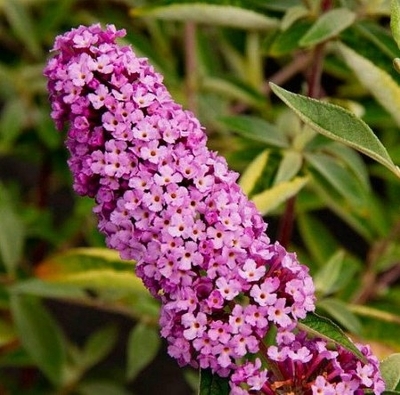 BUDDLEIA: Graceful gray-green foliage arches with flowers from summer into fall. The common name aptly describes this garden beauty. It does not wake up until late spring, but it's worth the wait! Flowers form on current growth. Should be cut back to 12-18" each spring. Will quickly grow back with many flowering canes. The Lavender Flutterby has lavender flowers that will cover the plant. It is a compact upright grower that is non invasive. Mature Height: 48-60 inches. Hardy Zones 5-9. Immediate shipping in 3" pot.